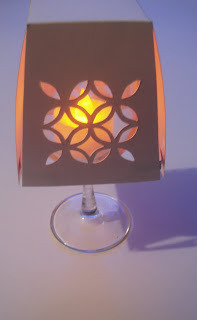 If you like this candle or tea light holder head to Stamping Mathilda blog. She kindly shared the template offering a real pleasure to all of us! Sometimes I honestly enjoy all this blogging going on. 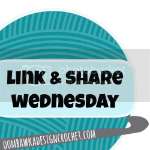 Thanks for the link on my blog! I love to see what people create with my templates. How clever to use it upside-down on a glass. I suppose you are using a battery operated tea light, it looks real. As always, I'm impressed by your cutting skills. It's battery operated tea light, yes. 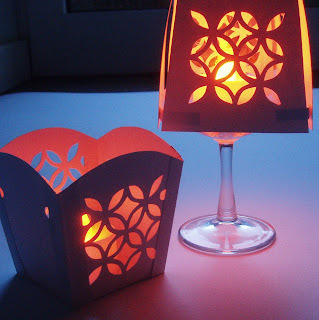 What a fantastic idea Nela, and your cutting is as ever perfect. Welcome to Cut Nela Cut I'm Nela. I want to share my passion for living a happy and creative life with you. I do believe in healing powers of everything that you make with your own hands. To me it is the crochet, helps me be mindful, appreciate the action and stop for a moment, step out of the bubble. Join me!